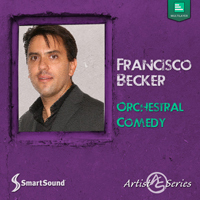 Another superb quality orchestral album from Artist Series composer, Francisco Becker. This time we get his classy and sophisticated take on music ideal for comedic settings of all sorts. Brimming with infectious comedic themes, this album covers pretty much any humorous, light-hearted backdrop imaginable including: hectic screwball, light-activity, comedic-suspense, the unsteady character, tongue-in-cheek tango, laughable moments and more. As usual for Mr. Becker, these rich, orchestral, Multi-Layer tracks give you access to all of SmartSound's technology benefits for the kind of creative control you can only get from SmartSound.